Frances, do you have any empathy whatsoever for people who are nervous around off-leash dogs or afraid of dogs? I’ve had to give up using Prospect Park since it became overrun by off-leash dogs. Encountering the off leash dogs and the owners who seem to feel that the park belongs to them and no one else just became too stressful for me. I don’t trust off leash dogs bounding up to me, I don’t know strange dogs or their owners. Can you give me one good reason why I should have to endure interaction with off leash dogs as a condition of enjoying the park? 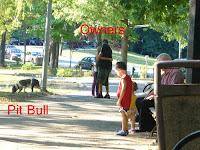 When answer Pashelle and the diatribe against off leash in Prospect Park, could you please explain the off leash rules in New York City? 1. Dog must be under visually and verbally under control of owner. 2. Hours are limited to 9 am - 9 pm when the parks are least used. 3. Off leash areas EXCLUDE all playgrounds, ballfields, nature preserves, flowerbeds, tennis courts, etc. In fact, off-leash areas are very limited. 5. Dog owners are 100% responsible for their dogs and actions by their dogs. It seems to me that Pachelle has a strong bias against off leash. That is fine, but isn’t the question -as worded- biased to make it appear that dogs are running wild all over parks? Prospect Park is one of the most dog friendly parks in the nation. It is surrounded by diverse communities. There are thousands of dogs and owners that use the park daily. Sure there are those who violate rules and they should be fined. When I am in the park with my dogs, I am always mindful of those who might be afraid or uncomfortable around dogs. We do not impose ourselves on others, but are always ready to introduce ourselves when parents ask if their children can say hello to my dogs. Pashelle can walk through most of Prospect all the time, and can avoid the off-leash areas when it is off leash time. One would not walk dogs through a ballgame in progress, so think of the off-leash areas the same way. Of course, some dogs should not be allowed off leash. No one disputes that. Frances, you have written wisely and obviously love dogs. Can you please explain to all readers the value of dog-dog, dog-human socialization? Also, reiterating what [the commenter] posted, the rules show that there are specific areas and times for unleashed activity. You are by no means being forced to endure any interaction with off leash dogs. 1. Above are pictures taken at Oakland Lake in Bayside, Queens on Sept. 1 around 5 P.M..
2. This past Monday afternoon, in Central Park’s Ramble, some woman was using on the grassy areas as an unenclosed dog run. 3. This morning in Central Park around 7:25, we saw a guy help his large dog jump into a fenced-in area near the bandshell. The area is fenced in—nobody may enter it—to permit the grass to grow. The dog proceeded to tear around the area, using it as his own private enclosed dog run. 4. This morning around 8, we saw a large unleashed dog running around the Ramble. 5. Around 10, we saw a large unleashed dog entering Central Park around 79th Street. It seems to us that we’ve seen the dog (and owner) in the same place before, unleashed. And, as we keep pointing out, while it is true that the neighborhoods around Prospect Park are ethnically diverse, the off-leash community is almost exclusively white. "I have spent a great deal of time closely observing dogs, and I can tell you that there is a spark that shines through when a dog owns its own movements and engages in play on its own terms. It is a kind of transformative magic. For most dogs unleashed play is healthy for their bodies through exercise, their minds through strategies and independent thought, their emotions through their pet friendships, their hearts through strengthening the bond they have with their person, and their spirits through what a sense of freedom does for all living beings." This is subjective opinion that is impossible to verify, but all this emotionalistic New Age babble sure makes people feel good and helps ameliorate their guilt for keeping large active animals captive in city apartments for most of the day. I have closely observed dogs too, all my life, having grown up with dog breeders and dog show people. I have seen that dogs are happiest when they are in tune with their owners and know their place in human society. When you treat dogs as equals, as furry children, and impose lofty humanistic ideals on them such as "freedom" and "spirit" and "friendship" among equals , you diminish the animal in order to feel good about yourself. Dogs are simply incapable of understanding and using these concepts; whatever spark and magic one gets from letting the dog run off leash comes from imposing your own fantasy of freedom on a dog that can never understand that concept as a human does. No doubt Ms Sheridan is familiar with "Merle's Door", a book by Ted Kerasote, which perhaps epitomizes the soft-headed imbecility of fanatical "off leash" adherents. Ted takes a dog, which looks to him for calm assertive pack leadership, and instead lets it decide how it wants to live its own life by allowing it to run loose all over the countryside in a Western state where stockmen routinely shoot dogs found at large. This criminally irresponsible form of dog ownership is lauded and presented as a high-minded experiment in deepening the dog-human relationship by giving the dog complete independence of movement. If you go to Amazon, you will be amazed at the ardent praise heaped upon this book. I really feel sorry for the poor dog in this book. How can a dog ever understand how to be "equal" with a human? It can only be confused by such an insane demand. Not surprisingly, in 2006 the New York Times printed a gushy op-ed by Ted Kerasote in support of the off leash policy in city parks. I was astounded at the arrogance of this privileged man, with thousands of empty acres at his disposal, recommending that dogs be allowed to run loose in overcrowded city parks.